Fourty Eight hours after President Goodluck Jonathan honoured the Eagles and rewarded them with cash, National Honours and plots of land in Abuja, topmost sports loving governor in Nigeria, Dr. Emmanuel Uduaghan takes his turn today to thank the team for making Nigeria proud at the 2013 African Cup of Nations in South Africa. Uduaghan will welcome the team today in Asaba where plans have been made to not only honour the players and coaches but also to make Delta people feel the Eagles and be part of the history they made by winning the Nations Cup with a 1-0 victory over Burkina Faso in the final last Sunday. “Asaba will almost close up today for the Super Eagles,”Amaju Pinnick, the Executive Chairman of Delta State Sports Commission said yesterday. Amaju said that the players will ride in a motorcade on the streets of Asaba and will later, at night, be entertained at the Dome. “It will be a night of entertainment,” Amaju said. “Top musicians like Inyanya, Ice Prince, D’Prince, Dr. Sid, Chudike and Burna Boy will play. 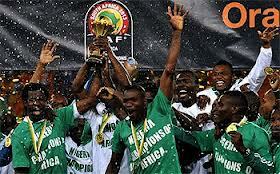 It will be a Valentine Night for Eagles in Asaba. Notable comedians like I Go Die, Okey Bakasi, Seyi Law, Da Klint De Drunk, Elemu and AY will also entertain on the night. He meant Nosa Igiebor, Fegor Ogude, Sunday Mba, Chigozia Agbim and Ekwuekwe. It is likely going to be more than a breakfast for the entire team today.